Washington City. 1814. 4pp. - Report from the Committee appointed on the 20th Ult. 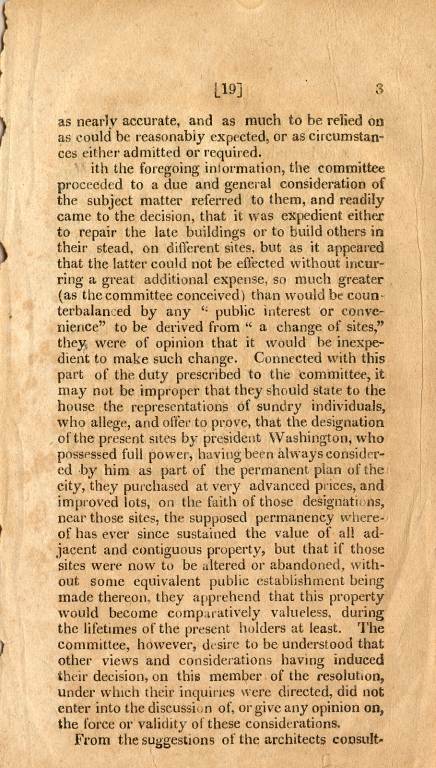 to "Inquire into the Expediency of Rebuilding, or Repairing the pulic buildings in the City of Washington. printed 1814. This historic document was printed by the Roger C. Weightman and is over 198 years old. 4 printed pages. Some soiling and foxing. During the War of 1812, the British burned various government buildings in Washington DC. 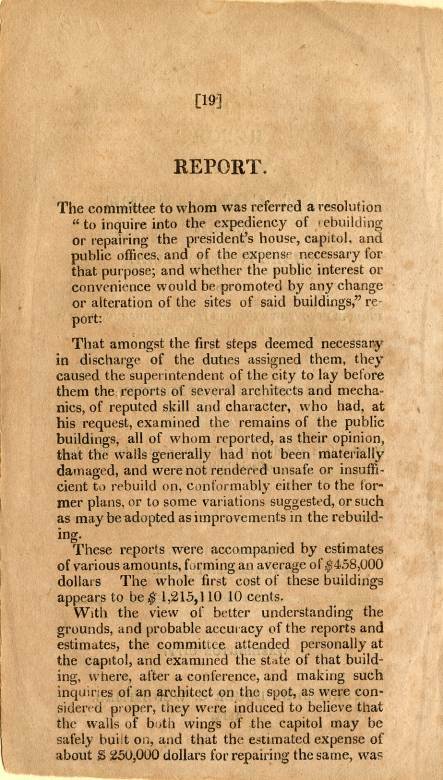 In August of 1814, Congress was evaluated the costs and logistics of rebuilding the public buildings of the nation's capitol. The report concludes that soundness of many structures were sufficient to rebuild them without significant cost or necessitating construction in new locations. 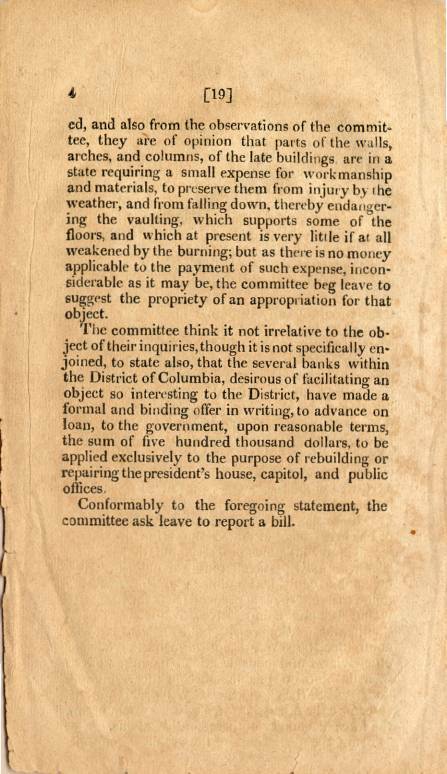 To aid in the construction "several banks within the District of Columbia...have made a formal and binding offer in writing, to advance on loan, to the government, upon reasonable terms, the sum of five hundred thousand dollars to the purpose of rebuilding or repairing the presidents house, capitol and public offices." Report of the committee appointed on the twentieth ult. to inquire into the expediency of rebuilding, or repairing the public buildings, in the city of Washington; and whether it is expedient to make any change in the sites of said buildings. November 21, 1814. Washington City. 1814. 4pp. Dbd. Untrimmed. Some soiling and foxing. Good. Following the British attack, and burning, of Washingtonc D.C. in August of 1814 Congress was forced to evaluate the costs and logistics of rebuilding the public buildings of the nation's capitol. The report concludes that soundness of many structures were sufficient to rebuild them without significant cost or necessitating construction in new locations. To aid in the construction "several banks within the District of Columbia...have made a formal and binding offer in writing, to advance on loan, to the government, upon reasonable terms, the sum of five hundred thousand dollars...." SHAW & SHOEMAKER 33403.